Pork rinds are (mysteriously) not that bad a snack. George W. Bush, near the beginning of his presidency said that they were his favorite snack, and sales shot up. 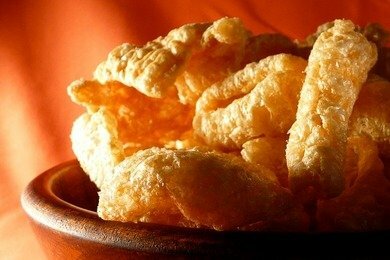 They are also really popular with Latin Americans and you can find them in markets under the name Chicharrones. What is a pork rind exactly? It is smoked, deep fried pig-skin and salt. When the manufacturers deep fry the skin, it puffs up creating this large crunchy snack. They are packed with protein, 8 grams in a 1/2 ounce serving. And, I find them oddly satisfying. Keep in mind that if you eat 3 ounces of them, you will be ingesting a grand total of 480 calories. Am I advocating eating many pork rinds? I wish I could because they taste great, but I am not. When you are faced with Cheetos, Doritos, and Pork Rinds, you are doing better by choosing the pork rinds. Why? Because they actually contain nutrients that your body needs. Unlike Doritos and Cheetos, I believe it is possible to keep your serving size to 6 pork rinds. First of all, it is much easier to count out 6 versus 21 Cheetos, and secondly after 6 pork rinds, you feel pretty full. You can find pork rinds that have additional flavor packets, which I would avoid because they taste pretty good all on their own. I don't know what is in those packets and they would probably lead you to eat more than a "snack" amount. How many calories in 6 pork rinds? Is that 1/2 oz?